Baby Things I Want: Skip Hop Palette Plate: Worth it or a Waste? Skip Hop Palette Plate: Worth it or a Waste? I think this Skip Hop Palette Plate is the cutest feeding plate I've ever seen, but the $24.99 price tag seems a little steep. 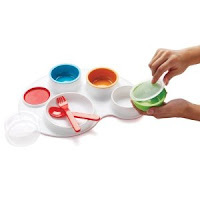 The package comes with one plate (or "palette") with three colored drop-in bowls (microwaveable safe), 3 lids for storage, and matching utensils. There is also a skid-resistant spot for a cup. One complaint I came across is that bowls to not snap into the palette, but rather are simply dropped in. That doesn't seem so baby-friendly to me. I can think of one baby in particular (no names..*cou--Hila--gh*) who would enjoy taking out the bowls, playing with them, and then seeing if she can get them back into the holders. So is the Skip Hop Palette Plate worth it or a waste? I'd say a waste. P.S. You can buy repacement Skip Hop Palette bowls. Yirmi (2 & 3 months) has made a habit out of tossing things on the floor. Perhaps if this came with a reasonably-sized target that you could put on the floor, he would really enjoy it. Maybe the baby would get extra points for getting a pea both onto the target and into mommy's shoe... And on a more serious note, I've found that giving babies too many different things at the same time seems to distract them from eating (it's much more fun to mix carrots with potatoes than to actually eat them), so I like to stick with one or two at a time. My vote: I'm with you - waste.